A “window seat” designed for a Cuttyhunk home, by Kochman Reidt + Haigh Cabinetmakers, isn’t actually a window seat at all, though it does afford a beautiful view of the sky. 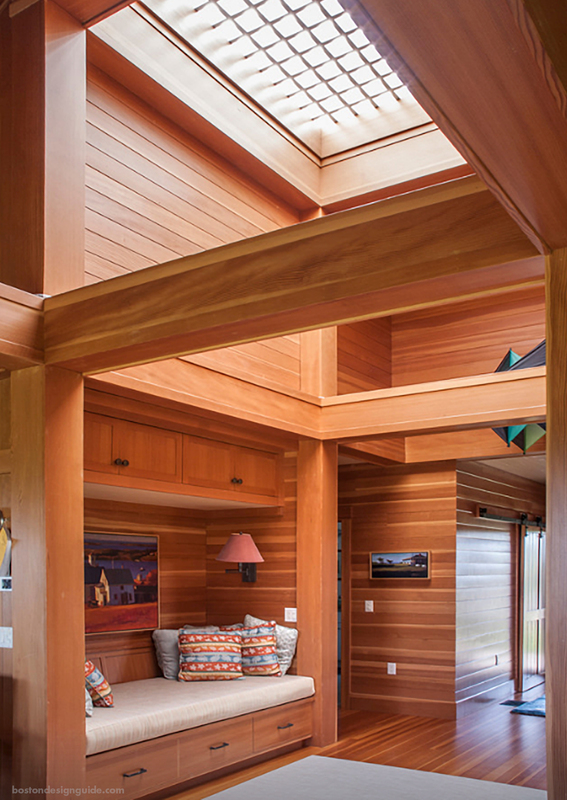 Situated at the intersection of the public and private realms of this low-profile island home, this custom built-in, crafted in Douglas fir, serves a dual purpose. The space functions as a relaxing reading nook when it’s just the two owners in the home and moonlights as a comfortable sleeping sofa for grandchildren when relatives come calling. It was designed “to create a sense of personal security and closure,” explains Partner Paul Reidt, so “you feel protected and cozy” yet not closed off or disconnected from the other public spaces of the home. The overhead cabinets were added to scale down the structure a bit and create that feeling of intimacy. Small reading lamps and lower and overhead storage make the space even more useful, allowing the homeowners to have bed linens and comforters at the ready for large family gatherings.